Euan Johnston of Kinning Park was the 'victim of a drive by shooting in Glasgow earlier this month. A car involved in a fatal shooting in Glasgow was stolen six months ago, police have revealed. Forensic tests are continuing on a burnt-out Audi Q5 found in the north of Glasgow in the wake of the murder of Euan Johnston, but officers have said it was taken from Parklands Country Club, Newton Mearns, in May and fake registration plates had been used on it. It comes as detectives returned to the scene of the shooting exactly a week on in a bid to find potential witnesses. A team of officers spoke to pedestrians and motorists at the junction where Mr Johnston was attacked in his black Audi RS4 estate on the southside of Glasgow. Police know Mr Johnston, 26, and a friend had been eating in the Red Pepper Indian restaurant and were returning home when the attack happened. Detective Superintendent Jim Kerr, the senior investigating officer, said no weapons have yet been recovered in connection with the murder. Mr Kerr said: “We know that the dark blue Audi Q5 was involved and we know that car was stolen on May 16 from Parklands Country Club and was using false plates. “The car was going at a fairly erratic speed and we are keen to speak to anyone who maybe has dashcam footage of it. 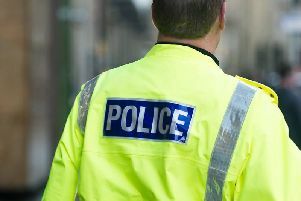 The return-to-the-scene operation centred on the Shields Road area near its junction with Kinning Park between 10.45pm on Tuesday night and midnight on Wednesday. Officers also questioned motorists in Balmore Road near Ashgill Road between 11.30pm on Tuesday and 12.25am on Wednesday. Mr Kerr said he is hopeful the operation will jog the memories of witnesses who may have seen or heard something around the time of the murder. Police are also keen to establish the identity of three men who were seen in Bracken Street, close to where the burnt-out car was found. “We are now one week into this inquiry and this operation is about speaking to motorists who perhaps uses these routes on a regular basis.” Mr Kerr said. “This was a targeted attack, however it was undoubtedly a very shocking incident and we are continuing significant inquiries to trace who is responsible.